After the bankruptcy of DAESH, “returning foreign fighters (FFs) are the biggest threat to EU”, a threat that “is likely to persist in the coming years”. Therefore, “an effective response to these issues requires a comprehensive approach and long-term commitment”. However, managing this threat is a challenging task that calls for a massive institutional effort. We can identify three levels of threat: mapping the foreign fighters that are coming back to the EU – in terms of numbers and location; detecting the routes they are following in their way back to the EU; the juridical possibility to convict them and, eventually, de-radicalize them. By addressing these three levels of the threat posed by the foreign fighters returned to Europe, this article will answer to three related questions: 1) How many foreign fighters have returned back to Europe and where are they now? 2) How did they come back to the EU? 3) How can we identify and de-radicalise them? To conclude, a reference to the current Italian legislation against foreign terrorist fighters will be provided, in an attempt to clarify how a coordinated and transnational approach to the issue is the best way to tackle this threat. A report commissioned by the Netherlands National Coordinator for Security (NCTV) to the International Centre to Counter-Terrorism in the Hague (ICCT) estimates that 3.922-4294 foreign fighters from EU Member States left the EU during the Syrian war, and that “around 30% have returned to their home countries”. Most of them came from mainly four countries: Belgium (the highest percentage), France, Germany, and the United Kingdom (see Fig. 1). 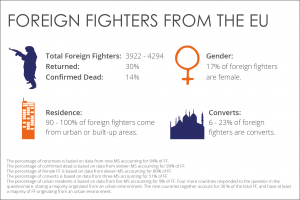 According to the ICCT report, there is not a “clear-cut profile of a European foreign fighter”. We can draw some conclusions from these data. We can infer that more than 90% of foreign fighters comes from large metropolitan areas and suburbs, and belongs to the same circles of peers of the same neighbourhood. Among them, 17% are female and 6 to 23% are converted fighters. As for the radicalisation path that led to foreign fighters’ departure, only some very broad trends can be outlined: the fighters usually have undergone a short radicalisation path, mostly related to friendships and groups’ dynamics. The nationality of foreign terrorist fighters has not been reported as a driving factor in their radicalisation, whereas their psychological willingness to become foreign fighters (a sort of “mental health status”) does play a role in their decision to leave their home countries. This kind of radicalisation is a common trend to the so-called “leaderless jihad” theorised by Marc Sageman as the new wave of Islamic terrorism radicalisation in the digital era. Broadly, a “leaderless jihad” is a way to interpret jihadist violence in which there are no charismatic leaders, nor a properly ideological understanding. Without any traditional pattern of radicalisation, other factors become the drivers of jihadist violence: kinship relationship, family networks, and friendship. A “network” radicalisation is severely dependent on societal factors and social environment. Radical milieus – or alternatively social environments prone to violence – are the most important catalyst factor in foreign fighters’ radicalisation. How do they come back? When it comes to foreign terrorist fighters coming back to Europe, one of the most difficult tasks to address for EU intelligence is to discover – and possibly close – the return routes followed by these individuals. We lack of precise and clear information on this issue. As a matter of fact, the porous borders of some geopolitical safe heavens could represent a gateway to Europe for many foreign fighters. In this sense, the Balkans weak states’ borders, alongside with the presence of strong jihadist communities and Islamic villages in that geopolitical scenario, could represent a relatively easy point of access to Europe. Additionally, the Schengen area could also help foreign terrorist fighters to come back to their own countries. In this case, the way back is very simple and for this reason EU Member States have strengthened controls on airport accesses and on passengers’ passports. 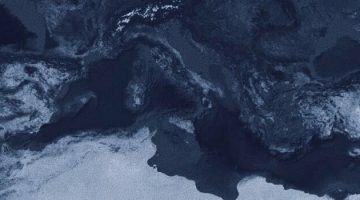 Finally, there is the well-founded doubt that also migration routes, as the Mediterranean one, could likely represent a way back for many terrorists. However, whilst this could be possible, there are very few elements that support this idea. Therefore, although the returning routes could be crucial in responding to foreign terrorist fighters threats, their complete understanding is far from being done. The return of foreign terrorist fighters to their countries of origin poses a harsh threat to EU M States and constitutes a challenge for the juridical systems of the EU’s liberal democracies. Liberal democracies are based on the rule of law, thus the most slippery aspect in dealing with returning foreign terrorist fighters is to balance the need for a conviction with the aim of respecting the fundamental rights and principle of countries’ penal codes. Generally speaking, what matters the most in juridical terms when it comes to returning foreign fighters is to prove the fact that they effectively took part in a terrorist radicalization training program in Syria or Iraq, and their active participation in terroristic activities. EU countries responded in two different ways towards returnee foreign fighters. Charles Lister from the Brookings Institution suggests two main categorisations: hard policies and liberal policies. Countries as the United Kingdom, the Netherlands, Germany, Austria, and France decided to adopt hard policies by adjusting their penal codes to new and more powerful counter-foreign fighters measures. Broadly, this has implied “enhancing prosecutorial powers, expanding the scope of measures for extradition and the revocation of travel documents, augmenting intelligence powers for surveillance, or criminalizing travel to foreign conflict zones”. The United Kingdom is facing a serious problem related to foreign fighters who left the country to fight in Syria, and has adopted a repressive-preventive system to tackle it. 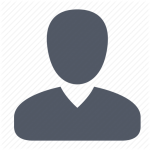 As a matter of fact, an individual can be arrested even before their departure, proving his/her active involvement in terrorist activities, or their willingness to engage in them. Since the early 2000s, the UK has invested in a powerful system of prevention of radicalization, developed to avoid the spread of radical messages and limit the contagion. One of the main elements of this prevention strategy was the Channel, “a highly flexible intervention program at the local level” conceived to fight the very roots of radicalization. On the contrary, the Country’s Terrorism Act drafted in 2014 and provided with a Royal Assent on February 12, 2015, is a set of standards that includes provisions to punish the foreign terrorist fighters. Section 6 and Subsection 2 explicitly sanction the “passive participation” to training aimed at terrorism. The most interesting part of the Country’s Terrorism Act is its travel limitations aimed at posing an objective obstacle for potential terrorists in leaving and returning to the country. As a matter of fact, the act explicitly seeks “to disrupt the ability of people to travel abroad to engage in terrorist activity and then return to the U.K.”, in particular through a “Temporary Passport Seizure” (14 days) in the case of suspected terrorism-related activity. This seizure is extendable to up to 30 days in case of a court pronunciation. Another repressive measure is related to the so-called “Temporary Exclusion Orders”, aiming at detecting UK nationals suspected of terrorism, attempting to leave or return to the countries. Germany has been significantly affected by the foreign terrorist fighters phenomenon. According to German authorities, in February 2014 over 270 individuals were fighting alongside extremists in Syria. The German counter-terrorism system can be considered “as a mix of repression and prevention”. Under German law, traveling in a theatre of conflict becomes a crime only if “you are participating in various terrorist activities during the conflict”. Section 129 of the German Criminal Code “punishes acts which can be deemed as the formation of, participation in and support for a terrorist organization. ‘Passive participation’ in terrorist training is also punished”. The German authorities implemented a “travel disruption plan” in order to prevent “would-FFs” from leaving the country through various procedures: these, in practice, are based on the logic of the “Gefährdeansprachen” (hazard talks), i.e. conversations aimed at intimidating the suspected foreign fighters and induce them to remain in Germany. However, in general, the prosecution of foreign fighters from a non-criminal perspective diverges depending on the Land (district). Against a foreign fighter suspected of threatening the nation, administrative measures can also be arranged: a) Non-German residents who stayed abroad and are suspected of having carried out terrorist activities, determined a violation of their visa status and will consequently lose their visa; b) strengthening the monitoring capacity of border authorities; c) the authorities must be informed of the movements within and outside the Schengen space. Alongside with these measures, Germany has developed some other effective liberal policies whose aims are not simply the repression of returning foreign fighters but also the attempt to implement de-radicalisation strategies. For this reason, the so-called “German model” of de-radicalisation is philosophically alike to the Italian one, as both develop strategies of prevention and repression of radicalisation. In the absence of an effective strategy for the prevention of radicalisation, simple repressive measures have not proved to be efficient in tackling radicalisation. In the field of prevention of foreign terrorist fighters’ radicalisation, since January 2012 Germany has been implementing a project known as HAYAT, in cooperation with the German Federal Office for Immigration. The aim of the HAYAT project is to try rehabilitate and reintegrate returned foreign fighters into the German society, whenever possible. Affective: try to restore emotional empathy between the returned fighter and their family of origin. Since radicalisation processes leading to terrorism involve two sub-processes, one cognitive (the acquisition of a radical mindset) and one behavioural (the progressive willingness to subvert the existing order), both the prevention and repression of the different radicalization forms are a crucial part of counter-terrorism strategies. Therefore, the HAYAT methodology could be considered as a model to apply for successfully dealing with returning foreign terrorist fighters. Addressing the punitive dimension of counter-terrorism (i.e., to tackle behavioural radicalisation) and establishing guidelines to de-radicalise individuals and reintegrate them into society is a crucial step in countering terrorism. Italy has adopted the same dual strategy, even if the country has not been characterised by any relevant form of foreign fighter radicalisation to date. In responding to returning foreign terrorist fighters, EU Member States are facing a complex task, between the need for avoiding the possibility that these individuals will commit terrorist crimes in their own country of origin and the necessity to protect the fundamental values of their being liberal democracy. For this reason, policy-makers must have clear, multiple, and effective policies in order to deal effectively with such a complex phenomenon. Prosecution and condemn: “All returning FFs who can be proven to have committed criminal acts—such as belonging to a designated terrorist organization, using weapons of mass destruction, involvement in murder, war crimes, or crimes against humanity—in foreign conflict zones should be prosecuted and sentenced”. In the case of remorse or regret towards violence, these elements should be evaluated case by case. Empowering families: Since the primum movens of foreign fighters radicalisation is community support and family connections, the most important thing to do is to include families in de-radicalisation processes. Avoid criminalisation: “Harsh policies of passport revocation and intensive security monitoring of Muslim communities only serve to deepen the feelings of victimization that extremists seek to exploit”. Use a multi-disciplinary approach to understand the phenomenon. Lister’s four policies are crucial steps in fostering foreign fighters de-radicalisation, although these alone do not suffice to tackle the phenomenon as a whole. Here, what is considered as the determinant factor in foreign terrorist fighters’ radicalisation is the social environment in which terrorists grew, all within Western society. Therefore, only taking action against the socio-psychological marginalisation that individuals may suffer in the suburbs of European cities may prevent the genesis of any new embryo of radicalisation. And this is the most effective policy that EU countries should consider to prevent the radicalisation of other foreign fighters. Banks, M. (October 12, 2016). “Returning foreign fighters are biggest threat to EU, Parliament warned”. The Parliament. Available at: http://bit.ly/2dcgYWA. Accessed online: January 18, 2018. European Council (January 16, 2018). “Response to foreign terrorist fighters and recent terrorist attacks in Europe”. Council of Europe. Available at: http://bit.ly/2fCRSCO. Accessed online: January 18, 2018. ICCT (April 2016). “The Foreign Fighters Phenomenon in the European Union”. ICCT Research Papers. Available at: http://bit.ly/2v0G1IC. Sageman, M. (2008)- Leaderless Jihad. Philadelphia: University of Pennsylvania Press, http://bit.ly/2najymW. See: Vidino, L. (2014, March). “Foreign Fighters: an overview of responses in eleven countries”. Center for Security Studies. Lister, C. (2015) “Returning Foreign Fighters: Criminalization or Reintegration?”. Doha: Brookings Institutions. Available at: http://brook.gs/2FiCLKv: 9.